When starting a wine bar or any restaurant that allows customers to choose from a varied wine collection, it is essential to create a corresponding wine menu template. This specially-designed menu allows diners to see an organized list of all the wine offerings and choose accordingly. Giving customers the freedom to choose the specific wine variety and year helps give them a positive dining experience. In this article, we showcase 15 different wine menu templates that any restaurateur or graphic designer could easily customize. The Calligraphic Inscription Wine Menu Design template embedded above is a menu card typically printed back to back on one card stock. This type of menu card design will also suit establishments that cater to a more formal crowd. To recreate this menu card design, it helps if you use calligraphy fonts so help heighten the card design’s effect. Notice that this menu design includes the weight for each serving of the wine but does not include the currency signs on the price of each serving of wine. This is an example of effective menu card writing. Learn more about menu design hacks for increasing orders. The Chalkboard Wine Menu Design is an example of a less formal way of presenting a wine list. Nevertheless, this type of menu design is often used in weddings and in less formal events like an art gallery opening party. To help accentuate the chalkboard designs on a menu card template, make sure to print the template on black card stock. As an alternative, wine bar owners may have the entire chalkboard menu replicated on a real blackboard. This will suit bistros who already have blackboard panelings as their overhead menu design. If you prefer a less direct approach, you may easily use the chalkboard menu design template above, custom edit it, and finally, print it out. 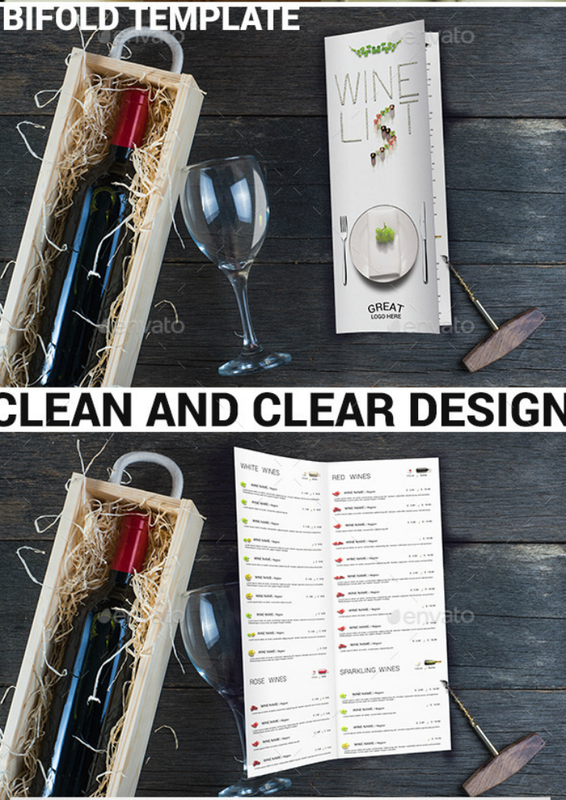 If you want a professional-looking restaurant menu design template, the Clean Wine Menu Design template may be the one that you are looking for. This menu design follows a foldable menu card format where the menu card face shows a minimalist flat layout of a table setting. Inside the card, you can see different wine classifications with corresponding descriptions and costs. The menu card design follows a simple layout that anyone may recreate seamlessly using any word processing software or by using Adobe InDesign. 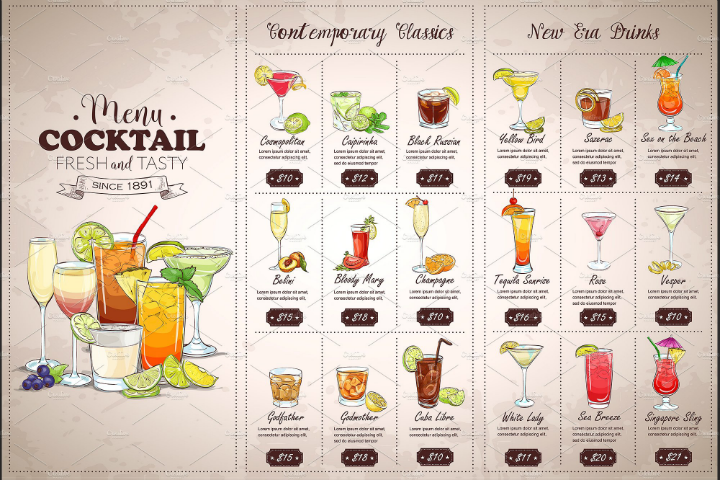 Unlike chalkboard menu designs, the Cocktail and Wine Illustrated Menu Design will suit dining establishments that want their customers to see a visual representation of the different drinks that they offer. In the example above, different wine varieties and cocktail mixtures are presented with their corresponding price tags, too. 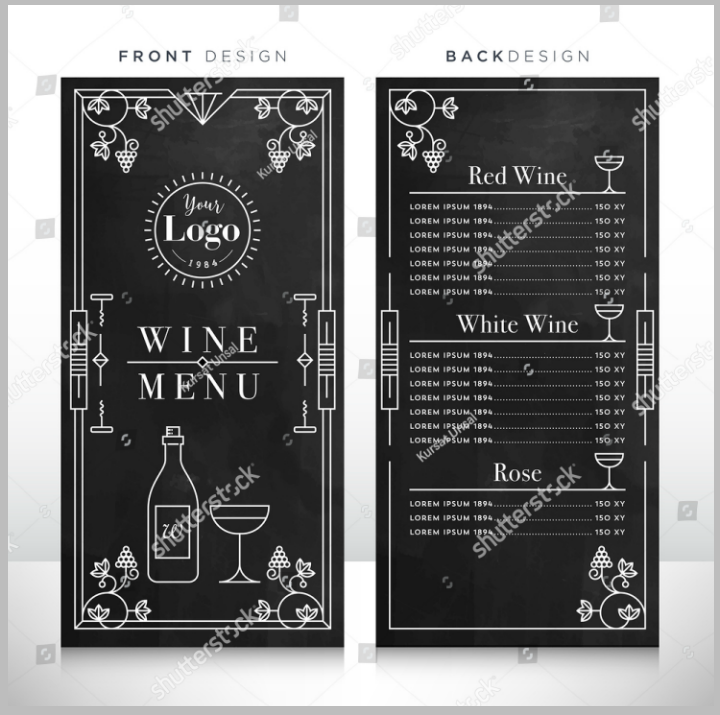 To recreate this wine menu design, you may need to commission an artist to create accurate drawings of the different wines that your establishment offers. However, if this is not possible, you may easily use different wine vectors and icons in addition to the menu template above. As a reminder, always make sure to include your business logo design when creating a wine menu from a design template. The Elegant Wine Menu Template pictured above will blend well as part of a wedding menu card due to its pink background and the cursive fonts used in the card design. This menu template is fully customizable so you may change the main image on the card face if this does not match your tastes. In lieu of this, you may add your restaurant’s official logo or mascot image instead. 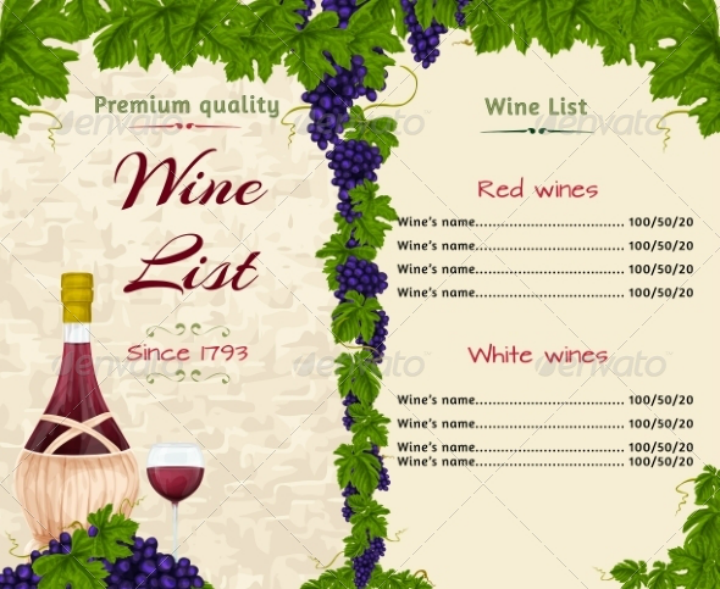 The Framed Wine List Menu Template pictured above includes design elements pertaining to wines and grapes. As a wine menu design, this could work well for pop-up wine stores, local wine bars, or establishments that do not have an extensive wine collection. 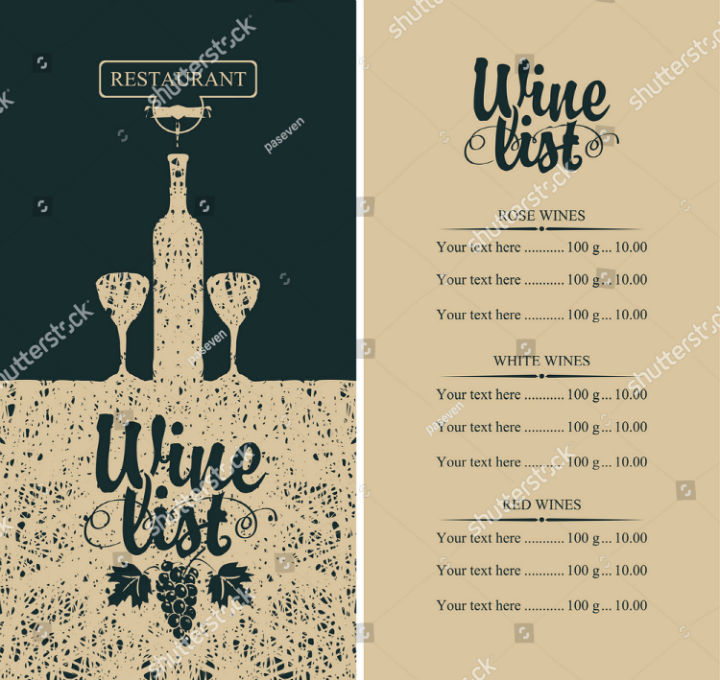 When recreating this menu card design, make sure to use realistic wine bottle and vine vectors to act as menu card borders. Just like minimalist business cards, the Minimalist Wine Menu Design features almost bare page designs without making the menu card boring. In this wine menu example, the wines are categorized based on the taste and feeling they evoke on the palate. There are also corresponding prices for different serving volumes that customers may want to try out. All of these information are presented in an unobtrusive manner. 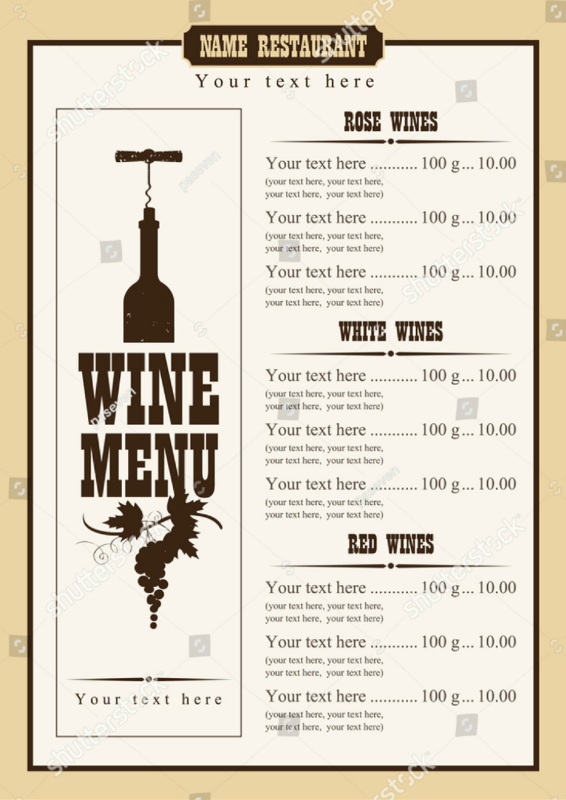 This type of wine menu design is best used if you want your restaurant to be known for the different varieties of wines that you offer. You may use the editable menu embedded above but anyone may easily recreate this menu design using a word processor. The Pastel Wine Menu Design template may suit dining establishments that want to attract more of the female audience. Its light colors and toned-down font styles make the different wines on offer appear more accessible and friendly. When printing out the Pastel Wine Menu Design template, it is best to use specialty paper to give the menu design a further touch of class. Another wine menu design that will seamlessly fit wedding parties is the Printable Wine Menu Design embedded above. This menu design is a printable card following the shape of a wine bottle. When used as part of a wedding card template, it breaks the monotony that most formal wedding invitations create. Using this type of menu card design is also helpful in letting guests feel at ease with an event. 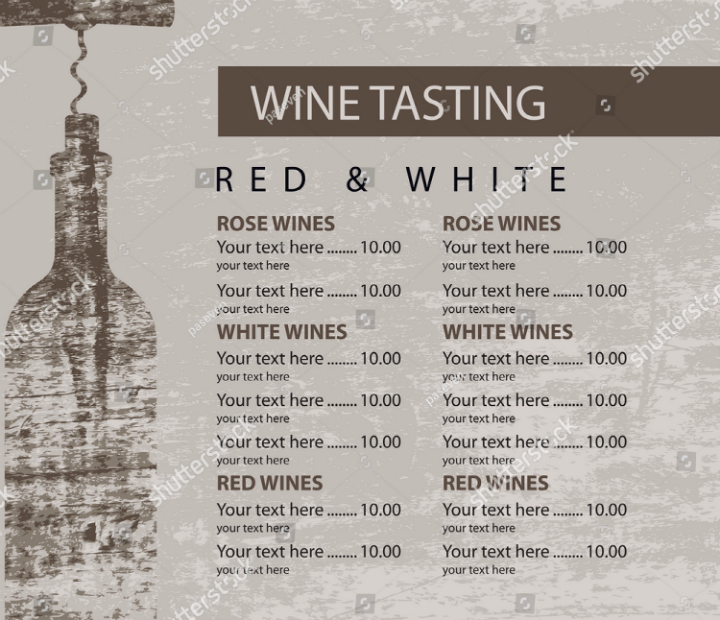 If your dining establishment mostly caters to an older clientele, you may benefit by using this Retro Wine Menu Design template. This menu design uses retro font styles that is reminiscent of the Wild West. While not using any pictures, this menu design still makes sure to include descriptions of the different wines they offer along with their corresponding prices. To transform this wine menu design into your own, make sure to use only two main retro typeface families. This ensures that anyone reading the menu card will not get overwhelmed. Never forget to add business branding emblems or logos to help increase the recognizability of your business. Wedding usually have separate menu cards for different parts of the reception. This is why the Rustic Wine List Menu Design template embedded above will fit seamlessly with any retro wedding invitation cards as one of their menu cards. Aside from weddings, the Rustic Wine List Menu Design may also work well in improving the ambiance of specific dining places. Note that there are other factors to change to improve the ambiance a restaurant creates and changing a menu card design is only a minor change. To achieve this rustic look for your own wine menu design, you need to print the template onto kraft paper or any corresponding card stock of the same color. Also, make sure to use rustic font styles since this will make the menu design more realistic. 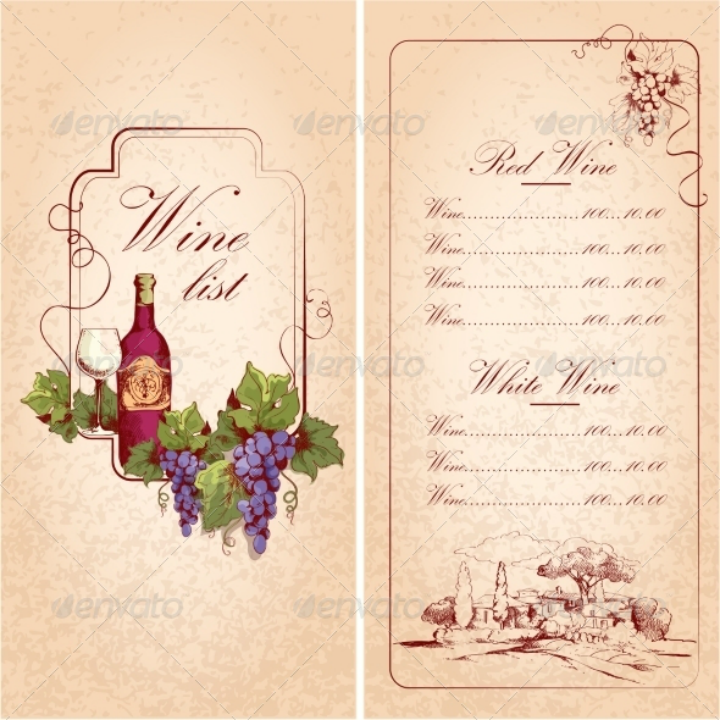 Choose the Vintage Wine Menu Design template if you want to take advantage of the timelessness of wine. 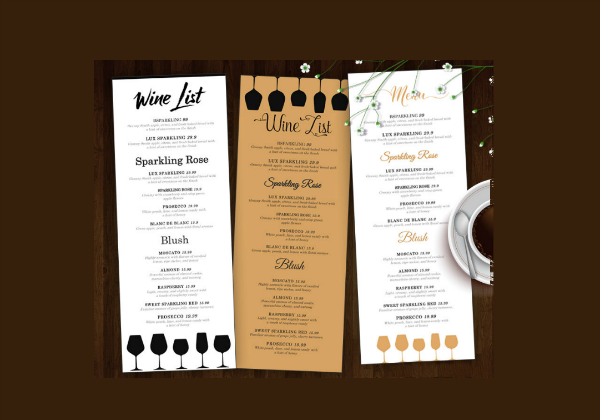 This wine menu design is best used for restaurants that have already established their own reputations in the dining industry. This type of menu design tells a customer that the restaurant knows what they are doing and that they know best about the wines they serve with their food. If you want to create your own vintage wine menu just like the one above, study how to use and apply different textures to a design template by using image editing software like Adobe Photoshop. Once you have mastered this, it will be easy for you to create different menu card designs in PSD. Another menu card design following the vintage trend is the Vintage Wedding Wine Menu Design Set. As its name implies, this specific wine menu design is best used as a wedding menu card. This menu template makes use of classic font styles and design elements. To avoid getting bored with just one menu design, you may use all the three wine menu templates included in this set and print them all out. This way, different guests will receive different kinds of wine menu designs. It can even be used as a conversation starter between guests during the wedding reception. When recreating this menu card design, make sure to use high-quality card stock or specialty papers that already have vintage-looking prints on them. 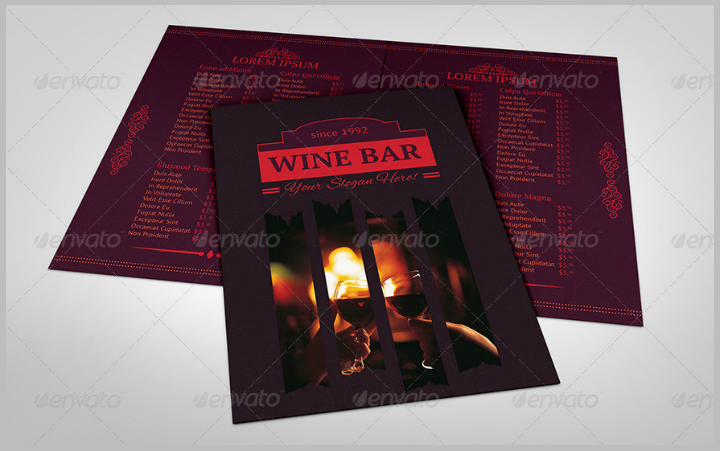 The Wine Bar Menu Design is another professional-looking wine menu design template. It may be used for different types of restaurants that want to establish a formality to their wine-ordering process. Choose this menu card design if you want an organized yet easy to customize wine list. 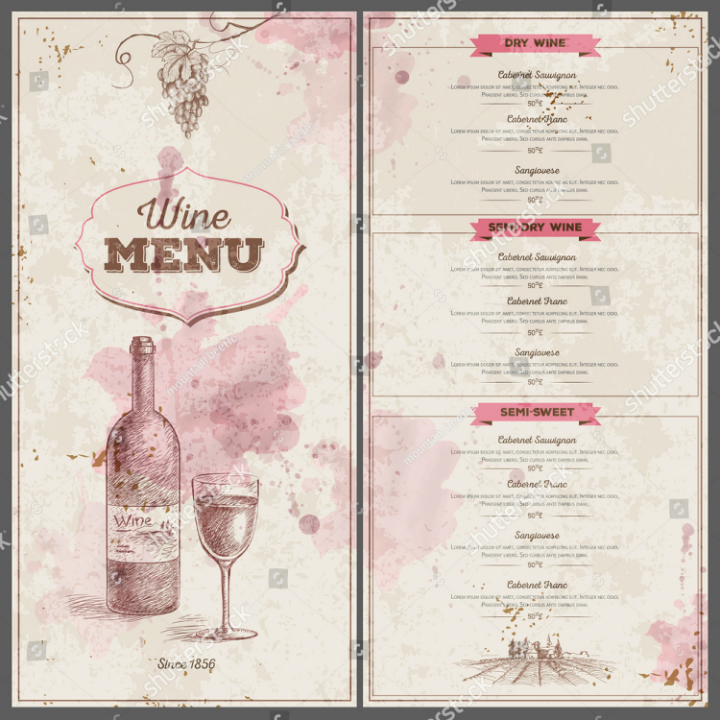 To create a sense of mystery and exclusivity to your restaurant’s wine offerings, you may use a menu design like the Wooden Texture Wine Menu Design template. As a vector file, this menu design template is relatively easy to edit. You do not need to have extensive Photoshop skills to make minor changes to the design template. An important note when recreating this menu design template is that you should add and adjust your company logo to match the color scheme that this template uses.